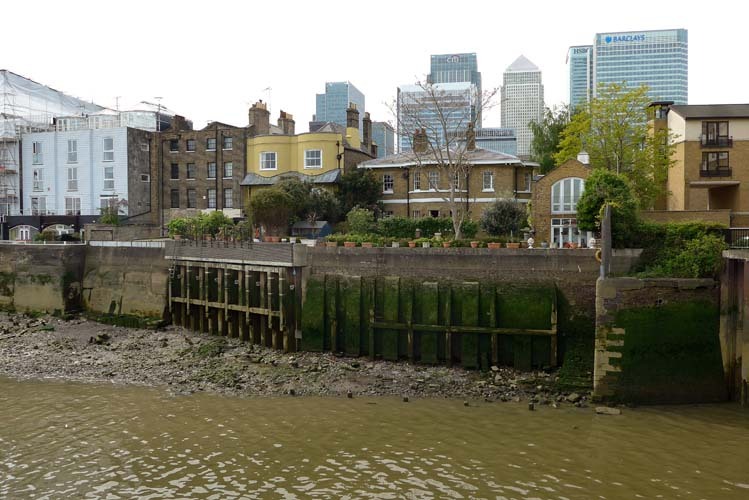 The Cold Hharbour which was home to our Keld ancestors is a short and very narrow street alongside the Thames in the borough of Tower Hamlets, East London, across the river from the famous O2 Building. 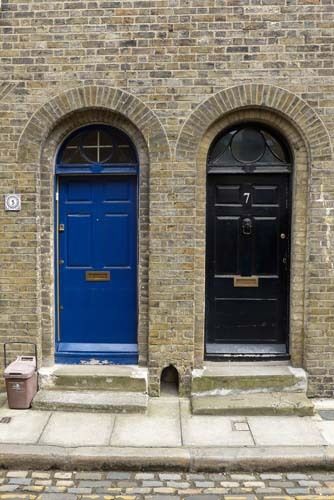 Two generations lived next door to each other in the second half of the 19th century. Our research has thrown up a large number of historical documents about the area, which was at the heart of London Docks in the 1800's when England was the hub of World trade. The areas around the docks are known by an assortment of official and unofficial names, and played an important part in the history of both our families, so we have written a page of background information about London docklands here. 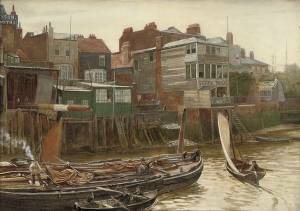 Perhaps our most remarkable discovery is a painting dated 1896 by Charles Napier Hemy, R.A., R.W.S. (1841-1917) (click here or on the picture for a larger image). It shows The Fishing Smack Inn (demolished in the 1940's), and rising over it to the right the roofs of the two houses occupied by the Keld family. The entrance to the Blackwall Basin is just out of vision to the right, and the masts of sailing ships in the basin are just visible in the distance. 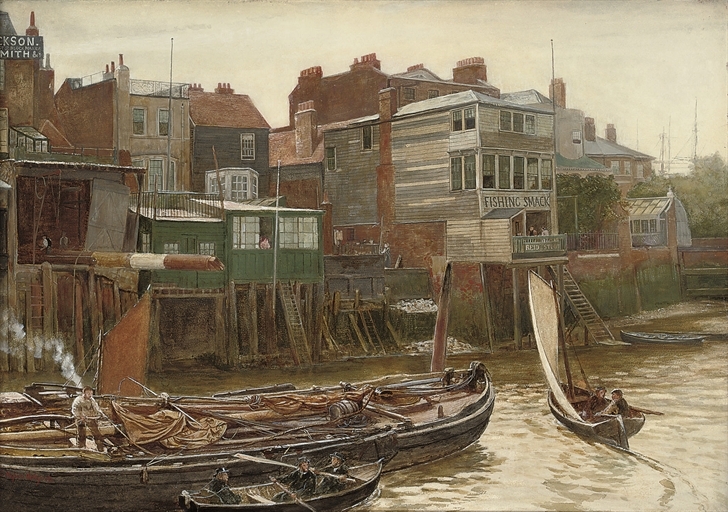 The older William who had lived next to The Fishing Smack had passed away some fifteen years before the date of the painting but the younger William had brought up a large family in the next house, number 34, between 1881and 1891 - by the time of the painting he was widowed, but might have still lived there. The pub went after World War 2, but the two houses occupied by the Keld family are still there, as are the next two houses in the distance. We now believe from the Isle of Dogs History website that the correct name is Cold Harbour! We will have made progress purging 'Coldharbour'! Nowadays the area is famous for the nearby Canary Wharf development which towers above the area to the West of Cold Harbour, and the O2 Arena directly across the river to the East. The wider area along the North of the river Thames is known as Tower Hamlets. 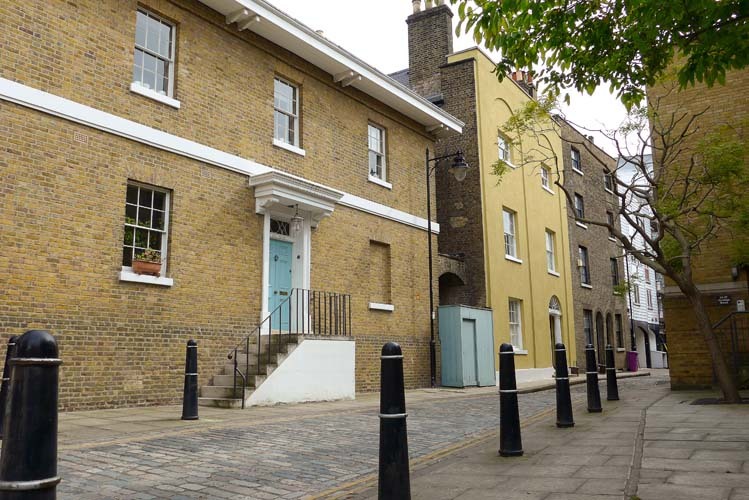 Number 1, Isle House built by John Rennie in 1825, was originally the Dockmasters Residence for the West India Dock Company. It was and is reputedly the finest house in Cold Harbour. 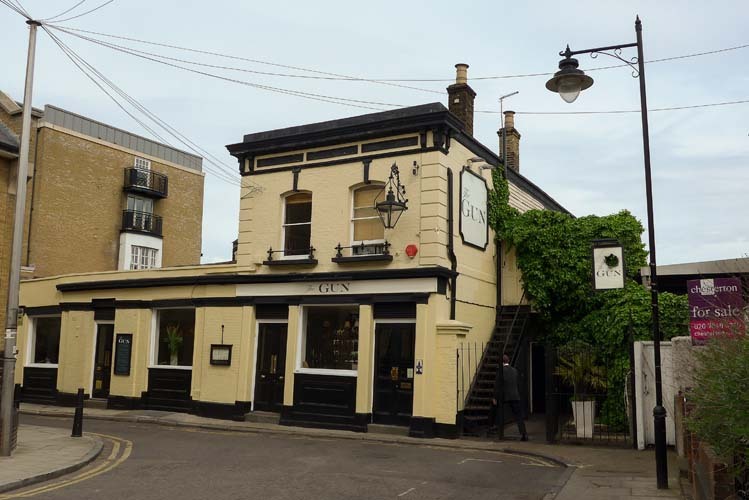 Number 3 is known as Nelson House; there is no evidence of any connection with Lord Nelson, although there are stories that the Lord was a regular visitor to the Gun public house further up the road and was even rumoured to have entertained Lady Emma Hamilton in an upstairs room. 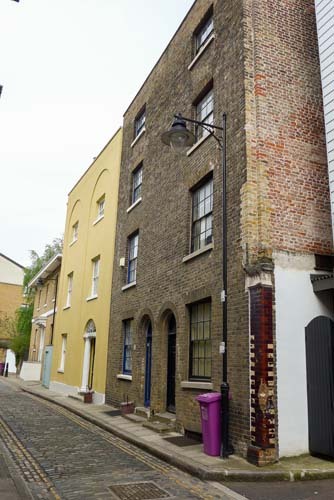 Rebuilt 1820 from two existing houses. Numbers 5 and 7, where our family lived, are an adjoining pair of houses of lower status but greater height than those previously mentioned - they are four stories high. We have accepted the general interpretation of the numbering of the street in our sources although there are some inconsistencies. The numbering as recorded in the 1881 and 1891 censuses was eccentric to say the least. In the 1881 census The record for the Fishing Smack public house is next to that of the house occupied by William Hatfield KELD (born 1825), clearly recorded as number 85. This doesn't look like a straightforward mistake because it is repeated in the 1891 census, although in this case number 85 has no recorded inhabitants. My source documents have 34 as next to 33. The Fishing Smack was built in 1760, when it was named the Fisherman's Arms. It changed its name to he Fishermans Smack some time before 1808, probably to reflect the arrival in the area of fishing smacks from Great Yarmouth. It was demolished after the second World War but there is firm evidence for it being where number 9 now stands. The redevelopment has used a similar building style to that seen in the painting at the top of the page, although the wooden structure was replaced in the early 20th century. We visited the area in April 2014 and now have our own photographs - Click on the picture for a larger image. In the picture the two adjoining houses in natural brick are numbers five and seven, where the two branches of the Keld family once lived. Next door painted yellow is number three, Nelson House. Number one, Isle House, is just visible at the end of the street. The Fishing Smack Inn is officially no more, but one part of it still exists. It is visible in the picture above, and more clearly in this closer shot. The story is that when the building was demolished the owner insisted that a part of it should remain, and that requirement has been honoured. 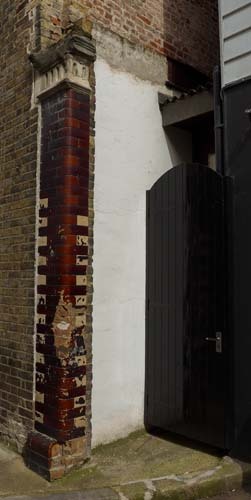 The front edge of the shared wall between the pub and number 7 is faced in glazed brown, and that is clearly visible in the picture above, and in more detail in the closer photograph. The tiled wall shows damage, which we originally assumed was recent, but a picture on the Island History website shows that it was already damaged when the Fishing Smack was demolished in 1948, so the damage is part of its history and not an excuse to remove it. If they got bored with the Fishing Smack next door, the Keld family could have walked the few yards to the Gun Tavern at the Southern end of the road. It is still trading, and seems to get good reviews. We haven't yet had time to find out how well the reviews are justified - perhaps next time! The Northern end of Cold Harbour seen from the River Thames, with London's financial 'square mile' in the background. Numbers 7 and 5 are to the left of the yellow building, Nelson House.This picture was taken from the jetty on the South side of the entrance to Blackwall Basin, which is open to the public. The Museum of London holds a good photograph taken in 1931 from the same position as mine. Coldharbour seen from its Northern end looking South, with number 1, Isle House in the foreground, number 3, Nelson House (painted yellow) in the centre, and numbers 5 and 7 in the background.